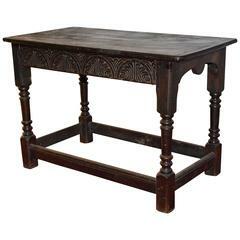 Excellent early Jacpbean side table with turned legs and trestle base. 1950s Italian gilt and cream paint decorated wood side table. Minor patina and paint loss. Small side table - D 12.75", W 12.75", H 17.38". This English library or sofa table has aprons of stylized leaves carved within repeated half circles, turned legs and stretchers. Unconventional vintage side table with a round top raised upon a tapered pedestal supported by an asymmetrical tripod base. All hand-carved utilizing antique elements. 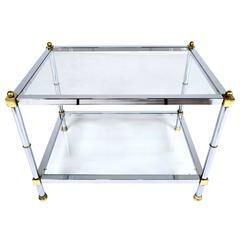 Chic side, or end table in solid aluminum having disk top on balustrade pedestal base. Top shows some cosmetic wear and oxidation, normal and consistent with age. Uniquely designed vintage iron side table featuring a chain top and horseshoe legs. (Please confirm item location - NY or NJ - with dealer). Baker occasional side table sitting on turned legs decorated with big turned walnut balls. X shape stretcher.